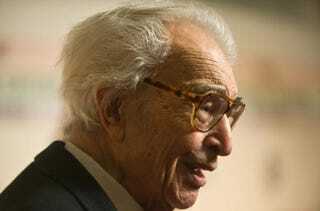 Although his birthday is on December 6, jazz great Dave Brubeck celebrated his 90th birthday at the closing of the CareFusion Newport Jazz Festival. With Wynton Marsalis' quintet playing "Happy Birthday" to a New Orleans beat, festival producer and founder George Wein led the audience in serenading the pianist. Brubeck was a late addition to a festival program that included performances by Herbie Hancock, Chick Corea, Ahmad Jamal and Chris Botti on the main stage at Fort Adams State Park. Marsalis sat in and played with Brubeck, who had done the same for Marsalis at the 2005 festival. Brubeck has played at Newport more times than any other performer, beginning in 1955, the second year of the festival. It is cool that fellow jazz legends "took five" to celebrate and honor the man who brought us the seminal record "Take Five." Read more at Yahoo News. Check out Dave Brubeck performing "Take Five" in 1961 below.